As the adage goes, you can’t improve a process without measuring its performance. But what exactly should you be measuring? Establishing a baseline for success based on key performance indicators (KPIs) should be the first step whenever you set out to improve something. Bill Gates points to the steam engine—one of the biggest advancements in the industrial age—as being a product of incremental design changes and precise feedback, as opposed to one Eureka! moment. In the Bill & Melinda Gates Foundation’s 2013 annual letter, Gates summarizes this idea, quoting a passage from William Rosen’s book, The Most Powerful Idea in the World. “Without feedback from precise measurement…invention is doomed to be rare and erratic. With it, invention becomes commonplace”. Minimizing downtime might seem like a worthy goal, but not if it has a negative impact on product quality or employee morale, or if it jeopardizes a long-term maintenance strategy. When optimizing the department, there are dozens of confounding factors to be considered. 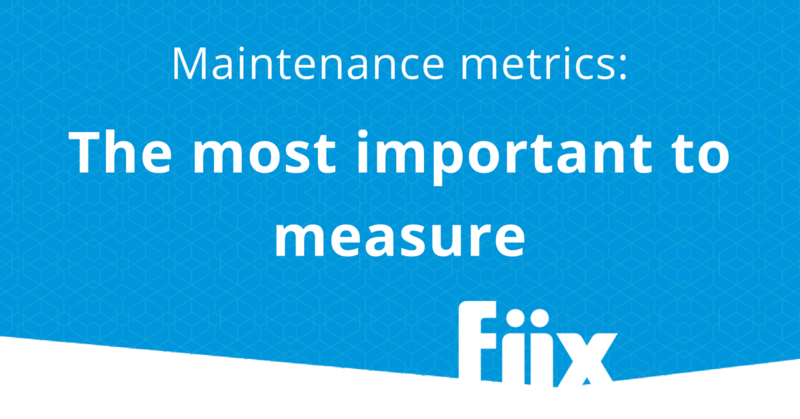 The struggle then becomes which maintenance metrics to focus on. The balanced scorecard approached was first introduced in the early 1990s and encouraged managers to track performance using a variety of metrics. The central idea is to avoid optimizing one area at the expense of another. This stands contrary to the age-old practice of measuring performance based solely on financial indicators, which tends to miss the whole picture. Hence, a new school of thought has emerged that reconciles high-level financial measures with more practical day-to-day indicators. Balanced scorecards provide a clear and effective approach to capturing a high-level view of the organization. *Cost/unit should be defined based on the specifics of your organization. Generally speaking, it will include some combination of labour, spare parts, overtime, contract labour, utilities, insurance, etc. This holistic approach to maintenance brings the organization one step closer to integrating maintenance with other high-level goals, and promotes the idea that maintenance should be viewed as an input to production instead of a necessary waste.